The cell. 5. Vesicular trafficking. Exocytosis. Atlas of plant and animal histology. Exocytosis is the fusion of vesicles with the plasma membrane. Vesicles for exocytosis are mostly shipped from the trans domain of the Golgi apparatus, are moved to the cell periphery and fuse with the plasma membrane. Vesicles can be also shipped by other organelles like endosomes. There is a bidirectional trafficking between endosomes and plasma membranes. Figure 1. From TGN of the Golgi apparatus, vesicles depart toward different cell compartments. Two pathways target the plasma membrane. One is known as constitutive exocytosis, which is present in almost every cell, whereas the other is known as regulated exocytosis, which is carried out in secretory cells. Regulated exocytosis needs a signal for the vesicles to fuse with the plasma membrane. From the TGN, another vesicular pathway delivers vesicles toward endosome/multivesicular bodies. In this case, vesicle formation is mediated by clathrin coats. There is another pathway with vesicles targeted to previous cisterns of the Golgi apparatus, mediated by COPI coat proteins. There are two types of exocytosis: constitutive and regulated (Figure 1). Constitutive exocytosis is present in almost every cell and carries molecules needed by the plasma membrane and extracellular matrix. It is the default exocytic pathway, a continuous trafficking where the amount of vesicles depends on the physiological state of the cell. Regulated exocytosis is present in cells specialized in secretion, such as endocrine cells, neurons, intestine epithelial cells, glandular cells, and others. For example, through regulated exocytosis, molecules are released into the intestine lumen for digestion, or, like hormones, they are released to the extracellular matrix to modulate the physiology of other cells located either close or quite far in body traveling, where they arrives through blood vessels. Vesicles of regulated exocytosis fuse with the cell membrane after a signal, which is usually an increase in the cytoplasmic calcium concentration. So, they don not fuse spontaneously. Furthermore, ATP and GTP are needed as energy sources. Constitutive and regulated exocytosis pack different types of molecules. TGN must be able to classify and separate both types of cargoes in different vesicles. Constitutive vesicles contain those molecules without a specific signal. This is the default pathway. In regulated exocytosis, the selection of cargoes is not well-known but it has been suggested that molecules form large molecular aggregates, which include precursors and enzymes. Many molecules are incorporated in regulated exocytosis vesicles as inactive forms, such as pro-neuropeptides. Enzymes process precursors inside the vesicle. Furthermore, in the TGN, molecules targeted to endosomes are fetched by clathrin coated vesicles, and those targeted to the endoplasmic reticulum are included into COPI coated vesicles. Regulated exocytosis vesicles are released from the Golgi apparatus and remain in the cytoplasm. After the cell receives a signal, vesicles are moved to specific areas of the cell periphery and fuse with the plasma membrane. So, it is a regulated process not only temporally but also spatially. Neurons are a good example of regulated exocytosis. In these cells, some vesicles are formed around the nucleus, in the soma, and are transferred to the presynaptic terminal, which can be several centimeters away from the soma. These vesicles fuse with the presynaptic membrane after an action potential gets to the presynaptic terminal. Other polarized cells are the enterocytes of the intestine epithelium, which have an apical domain facing the lumen of the intestine and a basolateral domain. It would be a catastrophe if vesicles loaded with digestive enzymes are released to the basolateral domain because the surrounding tissue would be digested. Regulated exocytosis vesicles are moved to the correct domain of the plasma membrane by microtubules and actin filaments of the cytoskeleton, helped by motor proteins. Exocytosis involves the fusion of a vesicle with the plasma membrane, and then vesicle membrane molecules become part of the plasma membrane. However, some electron microscopy images suggest other exocytosis mechanism, which has been named "kiss and run" (Figure 2). This model proposes that vesicles do not end as part of the plasma membrane because the fusion process is transient. There is an initial fusion between vesicle and plasma membrane that affects a small area of both membranes. A small pore is opened allowing the communication between the interior of the vesicle and the extracellular space, and soluble molecules are released by diffusion. The pore is transient and gets closed after a while, vesicle and plasma membranes are sealed again, and vesicle is free and empty in the cytosol. The kiss and run mechanism is thought to occur in many cell types, particularly in synaptic terminals of neurons and in chromaffin cells. It has also been observed that vesicles can be fused between each other before the fusion with the plasma membrane (Figure 2). This mechanism is known as compound exocytosis because the content of the vesicles is mixed before it is exocyted. Figure 3. Some vesicles bud from the early endosomes and are transferred to the plasma membrane. The purpose of this exocytic pathway is recycling. Early endosomes are targeted by endocytosis vesicles. Figure 4. In the presynaptic terminals, there is a local cycle of formation, loading, and exocytosis of vesicles. Vesicles are formed in the plasma membrane, near the presynaptic density. Once free inside the presynaptic terminal, vesicles get loaded with neurotransmitters. After the arriving of an action potential at the presynaptic terminal, vesicles are fused with the membrane at the presynaptic density and release the neurotransmitter to the synaptic cleft. Not every vesicle that gets fused with the plasma membrane is released by the Golgi apparatus. Early endosomes are organelles targeted by endocytic vesicles (vesicles formed in the plasma membrane)(Figure 3). 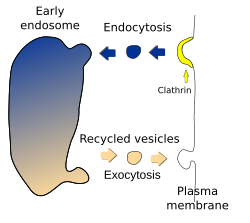 After the fusion with the endosome, some of the endocytosis vesicle content, particularly membrane proteins and lipids, is sent back to the plasma membrane by vesicles budding from the endosome. 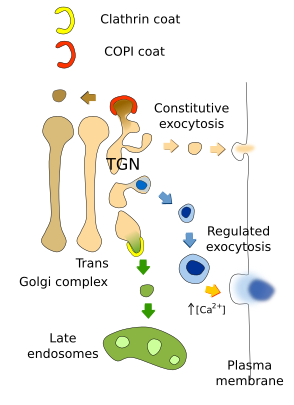 Another example of exocytosis independent from the Golgi apparatus is found in the synaptic terminals of the nervous system (Figure 4). Synapsis are usually far away from the Golgi apparatus, which is located in the neuronal soma. Neuronal communication cannot rely on a long and slow transport of neurotransmitters from the soma to the synaptic terminal, because the communication between neurons would be too slow and inefficient. Thus, there is a local exocytosis mechanism in the synaptic terminals. It starts with vesicle formation by endocytosis in the plasma membrane, near the synaptic density (where neurotransmitter are going to be released). Once vesicles are in the cytoplasm, they are loaded with neurotransmitters that cross the membrane vesicle by transporters located in the vesicle membrane. Once loaded, vesicles are transferred near the presynaptic density, where they are ready to fuse with the plasma membrane (exocytosis) after the action potential arrives. In this way, there is a continuous process of vesicle formation, loading and exocytosis (release of neurotransmitters) in the synaptic terminal, so it is much more efficient. Multivesicular bodies, endosomes containing vesicles, can occasionally get fused with the cell membrane and release their vesicles into the extracellular space (Figure 5). These vesicles are known as exosomes. This exocytosis mechanism was described in the 1980s, and the name exosomes was given to these vesicles. It was first observed during the maturation of reticulocytes to erythrocytes. During differentiation, reticulocytes get rid of trasferrin receptors of the cell membrane by endocytosis. These endocytosis vesicles fuse with early endosomes. During maturation process of early endosomes, the endosomal membrane invaginates many times to release vesicles inside the organelle. Transferrin receptors are, therefore, include in the membrane of the vesicles. Thus, early endosome is transformed in a mulvesicular body. Later, multivesicular bodies may be fused with the plasma membrane and released their content, including vesicles with the transferrin receptors. Figure 5. 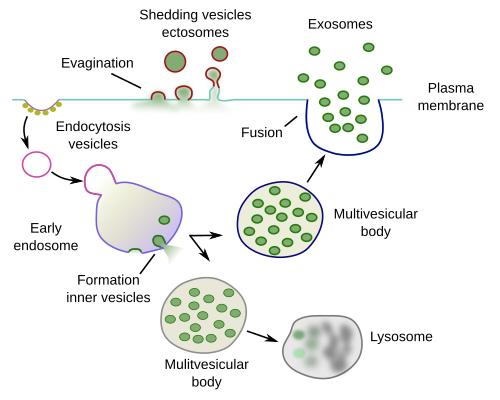 Formation of exosomes and shedding vesicles (adapted from Théry, 2011). Two types of multivesicular bodies may coexist in the same cell, those that end as lysosomes and those that get fused with the plasma membrane to release their content. These two populations are characterized by distinct surface molecules, such as Rab proteins and cholesterol in the endosomal membrane. In some cells, morphological differences have been observed between both types of multivesicular bodies. Exosomes are small vesicles, about 30 nm to 150 nm in size, release by a large variety of cells, such as epithelial cells, immune cells, neurons, glial cells, and cancer cells. The release of exosomes was initially thought as a mechanism for disposal of waste material, and that is why it did not catch much attention. However, it was later suggested as way for cell-cell communication, a mechanism for antigen presentation, involved in virus pathologies, AID included, and it was also involved in cancer metastasis. Under some circumstances, several organelles can get fused with the plasma membrane. For example, when plasma membrane is damaged, and there is a hole, cells has to seal that membrane interruption. Lysosomes, endosomes and endoplasmic reticulum can get fused to repair membranes by adding and sealing the breakages. Similarly, cells need to increase enormously the surface during phagocytosis to engulf a particle. The surface of the plasma membrane is increases by fusion of endoplasmic reticulum tubules and cisterns. Dikeakos JD, Reudelhuber TL. 2007. Sending proteins to dense core secretory granules: still a lot of sort out. Journal of cell biology. 177: 191-196.